THIS ITEM IS NOT AVAILABLE AT PRESENT. WE WILL NOT BE GETTING ANYMORE DC Flashpoint Batman Real Action Heroes 1/6th Scale Action Figure. From the Batman collection by Medicom. 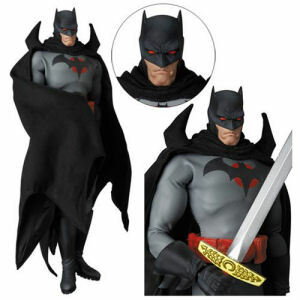 DC Flashpoint Batman Real Action Heroes 1/6th Scale Action Figure. This 12 inch tall alternate timeline Batman comes with extra muscle parts - interchangeable hands - a cloth outfit - display stand. Medicom Batman Action Figures shipping from Canada. No Surprise Border fees or Customs!